We are lucky enough to live within easy reach of East Yorkshire's glorious coastline. The beaches of East Yorkshire are all different from each other and all offer different things. 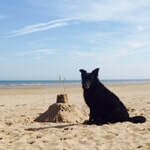 These are our favourite beaches going up the East Yorkshire coast from Spurn Point to Scarborough with information if dogs are allowed and various facilities and attractions available. Dog Policy: No dogs on the nature reserve (down to the point) but dogs allowed on the beaches from the car park going away from the point. The beach at Spurn is a particularly fossil-rich beach. There are coral fossils, chrinoid fossils, devil’s toenails and ammonites if you are lucky. We found some really nice pieces and also 6 shark egg cases (small spotted catshark) which The Boy was particularly excited about. There is a good discovery centre run by the Yorkshire Wildlife Trust and a cafe (dog friendly). You can also go on a 'Spurn Safari' where you go on a unimog (jeep type thing) down to the point (no dogs). This can be arranged through the discovery centre. So there is lots to go at - good walks, interesting things to spot, things to learn and good refreshments! Dog Policy: Dogs not allowed from the 1st May until 30th September. Withernsea is a sand and shingle beach with breakwaters along the beach. There is a nice new promenade complete with dancing fountains which the children can play in and it is smooth so perfect for prams and scooters etc. There are several cafes and ice=cream opportunities and a play area in the gardens near the Pier Towers. 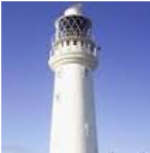 If you head into the town you can visit the Withernsea Lighthouse and climb up the 144 steps to get a good view. There is also a museum and a tea room in the lighthouse. Useful Information: There is ample parking in and around Withernsea. There are public toilets along the promenade. The lighthouse is open from Easter until October. Mappleton is a long sandy beach which is also a great fossil-hunting spot. You get to the beach by going down the slipway. There is beach to the right and to the left of the slipway. There is a sign that tells you to be aware that on the beach to the right that you might come across unexploded devices and to not touch them. (these are relics from WW2 when the cliffs at Mappleton were used as a practice bombing target). We have been to Mappleton on numerous occasions (and we always go right) we have only once seen anything,..Be aware that the tide can come in very quickly on this beach, cutting off the access / exit from the beach. The Old Post Office Tea Rooms on the road to the beach, are dog friendly and offer a good selection of cakes, ice-cream, food and dog treats. Useful Information: There is a free car park just by the access to the beach with toilets. There is a variety of things to do in Hornsea. The beach is a long sand and shingle beach. The promenade has been recently redeveloped and is a long, smooth promenade (perfect for scooters and the like). There is also a paddling pool along the promenade and not far away is the Hornsea Museum which is worth a visit (no dogs though). There are plenty of ice-cream, coffee and fish and chip opportunities. Useful Information: There are several parking options - free and pay and display, in the centre and also heading further north along the beach. 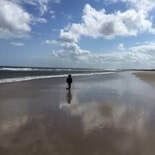 Fraisthorpe is a big, wide open expanse of beach which is great for dog-walking, kite-flying, sand-castle building and more. You will also often see kite-surfers and horse riders. To the south of Fraisthorpe is Barmston and to the north of Fraisthorpe is Bridlington. You can walk in either direction. It is about a 3 mile walk from Fraisthorpe into Bridlington. 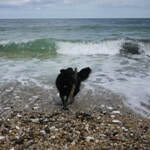 There is a car park with easy access to the beach and there is a dog-friendly cafe, The Cow Shed just a stone's throw from the beach which has seating indoors and outdoors and offers a range of hot and cold food and cakes and ice-creams. Useful Information: There are public toilets adjacent to the cafe. The car park is open all year round. It is about £3 to park. There is an attendant there in the summer months and an honesty box in the winter months. This part of Bridlington beach is situated by the park and ride. 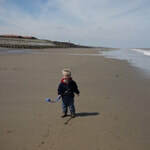 On this part of the beach and heading right towards Fraisthorpe, dogs are allowed all year round. The park and ride car park is a good place to access Bridlington beach. There are lifeguards in attendance and there are often activities going on organised by Active Coast. There is a cafe and toilets and warm outdoor shower facilities. There is easy access to the promenade here which runs all the way into Bridlington. You can also get the park and ride bus or the land train from here into Bridlington. The bus goes from near the toilets, the land train goes from the promenade near the cafe. The ticket for the car park includes the trip into Bridlington and back for up to 5 people. Useful Information: The car park and park and ride is closed from November until the end of March. The land train runs from March until the end of September. This is a wide stretch of beach popular with families and young children.Lifeguards are present on this beach. The promenade runs all the way along the beach into Bridlington and has beach huts, paddling pool areas, toilets and cafes. 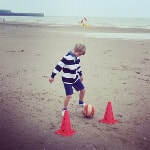 In the summer months there are also often activities organised by Active Coast on this stretch of beach. The land train runs along the promenade beach and stops at Bridlington. In Bridlington you can walk into the harbour where there is an array of sea-food shacks, ice-cream stalls, fish and chips, shops and also amusements and fairground rides.. 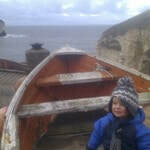 There is also a small museum and you can take a trip on the pirate ship or have a speedboat ride or go on a boat trip on the Yorkshire Belle to to see the seabirds just around the headland at Bempton Cliffs and Flamborough. Useful Information: There is parking available on the road along the beach but it can be tricky to find a spot. Alternatively you can park at the park and ride and get the bus or land train or you can walk along the promenade. Useful Information: There is some parking on North Marine Drive. The land train runs every half hour (from Easter until the end of September) prices start from £1.50 each way. Danes Dyke is a beautiful 1km stretch of beach. The cliffs are white, chalk cliffs and the beach consists of white stones at the top then sand when the tide is out. There is something about the light here in the afternoon, the way it reflects off the white cliffs and stones that makes it a very aesthetically pleasing spot. There is a car park at the top with a picnic bench, You access the beach by walking through the woodland down a fairly steep slope. For fossil hunters, there can be good sponge fossils and crinoids to be found here,. Useful Information: The car park is a pay and display car park. There is a kiosk with various refreshments and toilet facilities available in the car park. Flamborough South Landing Beach is accessed from a grassy car park at the top down a fairly steep slope . 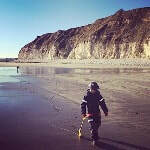 The beach is backed by grassy cliffs so is quite sheltered and at low tide there are lots of rockpools to be explored. Flamborough South Landing is also home to the Yorkshire Wildlife Trust Living Seas Centre which houses lots of information about the wildlife along the Yorkshire coast. There is also a cafe and toilet facilities at the top in the wildlife centre. There are also several walks that can be done in this area, including a circular walk through the woodland or along the coast towards Flamborough lighthouse. This is a lovely sheltered cove surrounded by chalk cliffs. The beach is about 3/4 mile long and is sand and pebbles. 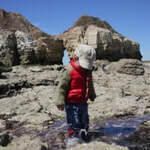 There are plenty of rock-pooling opportunities at low tide and the water is lovely and clear. To access the beach, you can park at the top (pay and display) then it is a fairly steep walk down, following the steps next to the lighthouse. Flamborough Lighthouse is open to the public for tours which last around 20 minutes. If you fancy tackling the 119 steps, it is open from the end of March at most weekends and daily in the school holidays (you can check opening times online). Children must be a minimum of 1.1m to go up and down the lighthouse steps. Useful Information: Next to the lighthouse there is a cafe, ice-cream kiosk, small shop and toilet facilities. The car park is pay and display. To find this use postcode YO15 1AR. Another great Flamborough beach. Quite a small sand and pebbles beach with nice, clear water, surrounded by chalk cliffs. There is ample parking at the top then quite a steep walk down to the beach. There are good rock-pooling opportunities at low tide. 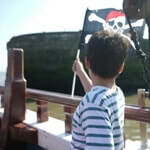 Boat trips - a 3 hour fishing trip or a 1/2 hour visit to smuggler's cave and to see the birds. can be arranged from this beach. There is a cafe at the top with indoor and outdoor seating. The cliffs around Flamborough are teeming with bird life. The wonderful RSPB Bempton Cliffs is just along the coast, where you can view thousands of different sea-birds living on the cliffs. Between May and early July you might be lucky enough to se some puffins. Next heading north along the coast from Flamborough is Thornwick Bay. There is cliff-top parking here, then you have to follow quite a steep path down to the beach. Thornwick bay is a white pebble / sand beach surrounded by chalk cliffs, with lots of rocks and great rock-pooling at low tide. The water here is very clear. You can walk on the rocks and at low tide you can go around the corner to get a view from the bottom of the towering chalk cliffs which are home to thousands of sea-birds. On the cliff tops is a the Thornwick Bay Cafe with indoor seating and outdoor seating. it serves a variety of home-cooked hot food and cakes and ice-creams.